DETROIT – The LGBT & Allies Caucus gathering at the bi-annual Michigan Democratic Party Convention is usually a fairly uneventful, lightly attended affair. 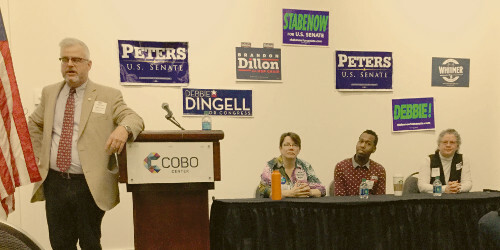 But at the Feb. 11 MDP state convention about 200 people crammed into a standing-room only space, and for the first time in anyone’s memory the proposed leadership slate was challenged in sometimes contentious voting. Mark LaChey, the chair of the caucus, opened the meeting with a report on the successes and growth of the caucus over the past two years. He said that when he took over as chair four years ago there were only a few dozen people involved. Now over 2,500 people are connected via the email list, the caucus Facebook page or the website, and there are often 20,000-30,000 views when LGBT-related political events or issues hit the news. “For the first time ever, we also have three openly gay members of the Michigan House of Representatives,” said LaChey, referring to state Reps. Jon Hoadley (D-Kalamazoo), Jeremy Moss (D-Southfield) and Tim Sneller (D-Genessee County). The next order of business was to elect the chair and three vice chairs. LaChey was nominated, as was Robert Vankirk who gave an impassioned speech about the need for more visibility within the party and implored the gathering to not settle to become simply “the Democratic Party’s checkbook.” Vankirk was one of many younger people at the convention who had supported Democratic Party candidate Bernie Sanders for President in 2016, and who expressed frustration with current party leadership – including leadership of the LGBT Caucus. LaChey ultimately won reelection for another two-year term, and in his acceptance speech reached out to Vankirk, saying he hoped to work with him to implement some of the ideas for outreach and communication that Vankirk outlined in his bid for the chairmanship. Jan Stevenson was then reelected by acclimation for another term as first Vice Chair. The other two Vice Chair positions went to Roland Leggett and Susan Grettenberger, both of whom were challenged by new members of the caucus. Leggett won election over Sam Jones Darling and Drew Marsh. Grettenberger won election over those same two candidates, plus Rachel Strickland and Noah Getz. The most contentious moments came when LaChey tried to speak during the voting process. Twice he was called upon to respect “point of order” and move on to voting. Clearly frustrated, he acquiesced to the groups’ requests and moved along the agenda. After the meeting, the four newly-elected leaders each sought out those that had run against them and asked for their help in building a stronger LGBT Caucus. The 2017 MDP conference attracted almost 5,000 people – by far the largest crowd to ever attend, and people were energized and focused on working to elect Democrats to offices at local and national levels. In addition to the LGBT & Allies Caucus, there are 21 other constituency caucuses of the MDP such as the Black Caucus, the Veterans’ Caucus and the Labor Caucus. Record crowds were at all the caucus meetings and leadership was challenged in many of the other caucuses, often by younger people seeking a larger voice in the party. LaChey said he will follow up on requests for local town hall meetings, regular conference calls and other strategies to energize LGBT people and our allies to run for office at all levels of government, work on campaigns and donate money to LGBT-friendly candidates. For more information about the LGBT & Allies Caucus of the Michigan Democratic Party find them on Facebook or email mwlachey@comcast.net.